The Governor of Benue state, Samuel Ortom has made it clear that he is no longer a member of the All Progressives Congress (APC). Ortom said this on Friday, July20, 2018, in Makurdi while speaking to journalist after his meeting with the leadership of the APC, Sun News reports. This is contrary to what the Governor reportedly said in Abuja on Thursday, July 19, 2018, while addressing journalists. 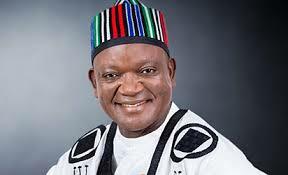 Ortom told newsmen while in Abuja, that he is still a member of the ruling party. The Governor, who was in Abuja on the invitation of the APC leadership, met with APC national chairman, Adams Oshiomhole and other members of the National Working Committee behind closed doors. He was summoned following his announcement on Monday, July 16, 2018, saying that he has left the APC. Governor Ortom also said that he will follow whatever the people of Benue asks him to do. “For now, where I stand is that I have not defected to any political party. I remain outside the pitch because I have been given a red card by the leader of the party in the state. As to whether the red card is quashed is a different thing until I hear from them. I have not gone to any other place. But if the Benue people ask me to leave APC, I will leave. “If people are misrepresenting me, it’s a different thing. I met with the national chairman of APC. We are still talking. No decision was taken on anything. Further consultation is going to take place. I will do whatever the Benue people tell me to do. I have not made a u-turn. “The National Chairman of APC invited me and it would have been dishonorable not to honour the invitation. But I’m not alone on this journey. They (APC) are doing consultation and I’m also doing consultation,” he added. Governor Samuel Ortom and some top members of the Peoples Democratic Party (PDP) were in Kwara state on Tuesday, July 17, 2018, to meet with the Senate President, Bukola Saraki.